Crab Trap	The spirit world is real! Look around and see the signs of the times. Things are changing on this earth before our eyes. Every area of human life has been affected by some change. A SHIFT on earth is occurring. Some can hardly catch their breath as you watch the news and the daily sad worldwide and local news stories are revealed. A shift is occurring. I posted a message given to me by the Lord in 2008 about coming events on one of my blogs. While in prayer last week…the Lord told me that things in the future are going to be more difficult. We are in these trying times for the long haul. The Holy Spirit is doing a tremendous amount of work in people’s lives according to the Lords plans. We are going to see a major shift in the spiritual climate. Those who are seeking truth and want a closer walk with God will grow. Those who will spread the gospel and stand up for truth will do so boldly. The weak will be very strong and a light that points others to Christ. False teachers have and will continue to be exposed. Those who know God’s word and understand truth will be mighty soldiers for the Lord. The living waters from truth will put out the fires of the false prophets. The Lord wants those who are His to…Pray and walk with Him, read and study the word, commit to serving the Him, spread the gospel, Love others, worship Him and thank Him for all He does and has done for you. The Lord said to tell you that you are Safe in His arms through everything that is going on. If you need to…. read Psalm 23 & 27 over and over until it brings understanding and peace to your soul. Trust in God! This information today is not to scare anybody. Everyone can see for themselves what has been going on and one has to know that or have their own feelings and know that there has been a shift. This is not time to be scared…but a time to PUT YOUR TRUST IN GOD like you never have before. Start putting God first now and don’t wait for things to happen and then coming running to Him in your distress. Worship Him …get closer to Him now. This is serious….I feel seriousness in my spirit. I posted a video on YouTube last week because of this seriousness I feel. I feel the shift and I’m responding to it and sounding the alarm that the Lord is speaking….and those who have spiritual ears will hear what the spirit is saying to each person. Don’t just take my word for it or think I’m off my rocker….but pray…ask God what is going on. He will reveal His plans and heart to you. I pray that you are in that place you need to be with Him….in Jesus name…Amen. Bless you for posting this, Tanya! I, too, feel the shift and know deep in my bones that times are changing. God is calling His own and urging us to stay close to Him, whatever the future may bring. I think this is where we are all feeling it….people know. But like you said…stay close no matter what the future may bring. Very wise words!!!! I agree. God bless you for sharing what you hear from Him. 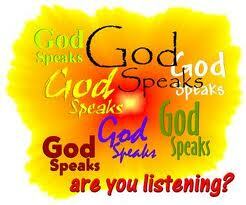 God speaks…I listen…and share. God is good! We are one day closer! Could you please pray for me? My name is Chris…. I am struggling with depression and hopelessness. Hello Chris…May God bless you and keep you in perfect peace …in Jesus name. Chris…I would like to talk with you about your struggles. Can you write me in the sidebar on the righthand side of my blog page? There is help for your struggles. I know the Lord can and will help you. He is a healer of the soul, spirit and mind. Be encouraged today. I look forward to hearing from you.